The stunning views of Table Mountain and the Cape Town harbour from the glass lifts of the hotel greeted delegates to the 2015 Annual CSTL Sharing Meeting. 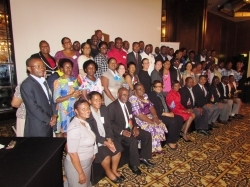 Over 70 participants representing SADC Member States attended. The opening session ended with a bang, literally. Delegates were treated to a performance by the Pennsylvanians, a Cape Townian minstrel band. Their happy songs and cheerful costumes had everyone clapping hands and off their chairs dancing. Everyone left the session with big smiles on their faces. Over the next two days, all 14 Member States in attendance made presentations on initiatives being implemented in their countries in support of care and support for children in schools. The sessions were organized around the main complementary service areas within CSTL essential package of services, e.g. school health, nutrition, psychosocial support, safety and protection, social welfare, and water and sanitation. There were also presentations on the SADC Policy Framework, monitoring CSTL in schools, and MIET AFRICA’s RHIVA (Reducing HIV in Adolescents) programme. Highlights included: the presentation by Rose Smart, entitled CSTL: Policy to practice, which gave fascinating background as to how CSTL has evolved over the years; the Mother Groups presentation by Malawi, about an initiative started as a response to the high number of dropouts among girl learners; and the presentation by Mozambique on a zero-tolerance programme, and which involves child protection and safety issues. Dr Vitalis Chipfakacha gave an update on the ESA commitment on adolescent sexual reproductive health and rights. As some of the participants had to stay over for their flights, on the last day of the conference, delegates were treated to an excursion around the Cape Peninsula, giving them a chance to take in the majestic beauty that is Cape Town, South Africa’s “Mother City”. Who knows how many selfies were captured that day!